If you need a fast and free way to analyze your weight loss progress, then there’s no better way than the Personal Weight Loss Chart. This template comes packed with tools to help you progress towards your fitness goals. All you’ll need to do is fill out the required information mentioned in the template and this document will calculate the rest for you. If you have the drive and patience to achieve better physical health, then why not make it a little easier on yourself? Download the free Weight Loss Chart today. To download the free template to your computer, just click the link provided for you at the bottom of this page. You can enter your name, age, start date, and a number of days you work out in the first column of the template. Likewise, in the top half of the page, you will enter your starting weight and your ideal weight in the indicated cells as well. This template will automatically calculate your maximum and minimum weight throughout the course of your workouts. Now, begin filling out your information in the main table below after you work out for the first time. Just enter the date and your current weight. The template will take that information and give you the amount of weight you’ve gained and lost over the amount of time you’ve been entering your data into the document. The template will use these figures and estimate the percentage you have left to achieve your goal and even display your progress in a graph to the far right of the table. When you have reached your goal, the template will indicate that with a little sign of congratulation in the “To Goal” section of the document, as you reach 100% completion. 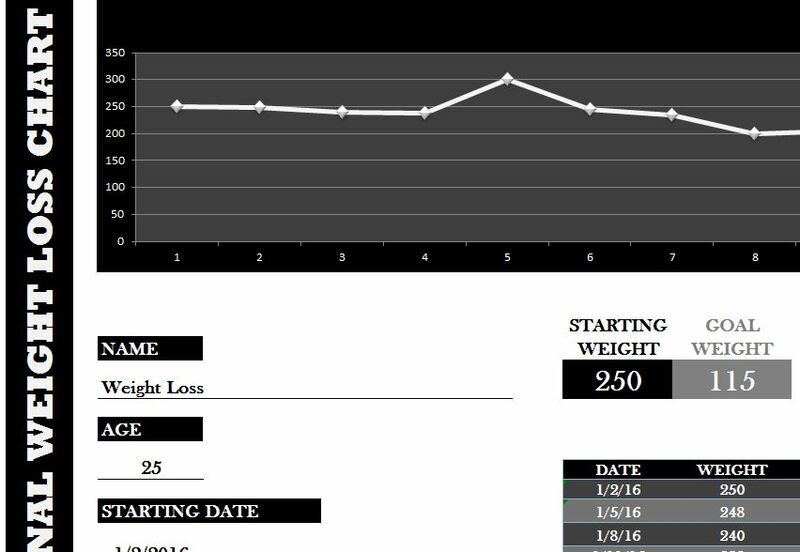 Achieve you ideal weight by downloading this free template today.